The four-year-old hurdling championship, staged over two miles and a furlong, is always a thrilling spectacle and has attracted 77 entries, headed by the Alan King-trained Mille Chief. 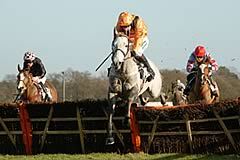 King has twice tasted victory in the Grade One contest with Penzance (2005) and subsequent Smurfit Kappa Champion Hurdle hero Katchit (2007), while Franchoek (2008) and Walkon (2009) both finished second for the trainer. Mille Chief has won his last two starts in fine style, seeing off the Charles Egerton-trained Westlin’ Winds at Kempton in December and then easily landing the spoils at Huntingdon last month. King’s quartet of entries also includes Peter Grimes. Nicky Henderson has four JCB Triumph Hurdle wins to his name, including last year when Zaynar scored. He has seven horses engaged, all of whom are yet to jump a hurdle in public, including According, a smart Flat recruit from France. Advisor followed an easy win at Newbury in December with a defeat of the Warren Greatrex-trained Barwell Bridge and the gelding, owned by the Royal Ascot Racing Club, is one of seven Paul Nicholls-trained entries. The British champion trainer’s entry also includes Sang Bleu, Royal Mix and Pistolet Noir, a big money purchase out of Nick Williams’ yard after defeating Barizan in the Grade Two Prestbury Juvenile Novices’ Hurdle at The Open. Pistolet Noir was subsequently runner-up to the Nigel Twiston-Davies-trained Baccalaureate in the Grade Two Betfair Finesse Juvenile Novices’ Hurdle over the course and distance on Festival Trials Day. Royal Mix defeated the Nick Williams-trained Me Voici at Newbury in November but the latter slammed Sang Bleu to win the Grade One Coral Future Champions Finale Hurdle at Chepstow the following month. David Pipe has entered Notus De La Tour and Hunterview, while John Quinn has engaged Doncaster winner Blue Nymph, Tom George could run Olofi, successful over the course and distance in December and Brian Ellison has entered the smart Bothy. The Howard Johnson-trained Ascendant was an easy winner at Musselburgh on his hurdles bow, while the Gary Moore-trained Orzare saw off Hunterview at Newbury in December and the James Ewart-trained Premier Grand Cru won over hurdles at Pau that same month. The last Irish-trained winner of the JCB Triumph Hurdle was the Willie Mullins-trained Scolardy (2002). Of the 21 Irish entries, Mullins has the easy Gowran winner Secant Star, Final Approach and Doctor Deejay, who was runner-up to the Charles Byrnes-trained Pittoni in a Punchestown Grade Three last month. The Gordon Elliott-trained Carlito Brigante landed a Leopardstown Grade Two in December from the Edward O’Grady-trained Alaivan, with the Noel Meade-trained Cross Appeal in fourth. O’Grady won the JCB Triumph Hurdle in 1984 with Northern Game. Henry de Bromhead has entered the smart Flat recruit Gallilei, while Point Of Light, a prolific winner on the level, is one of two Paul Nolan-trained entries alongside Thurles victor Politeo. Shanrod won his only hurdles start at Navan in November for Mick Halford, while Sounds Of Jupiter scored at Limerick in January for the Byrnes stable. Class 1, Grade 1, Total Prize Fund £100,000. 1.30pm, Cheltenham, Friday, March 19, 2010. Two miles, one furlong. For novice four-year-olds only. Weights: 11st each. Allowances: fillies 7lb. Entries closed Tuesday, February 2. Entries revealed Thursday, February 4 (77 entries). Scratchings deadline February 23, six-day confirmation stage Saturday, March 13. Final declaration stage 10am, Thursday, March 18. Form figures supplied by Weatherbys and are correct up to and including the racing of Monday, February 1. May not include some overseas form.